Memorial held for Carmel Fire victims. Widow: We balance pain, new life. A memorial was held Tuesday to mark two years since the Carmel Fire disaster in which 44 people were killed. “There are questions that are always with us, that are so powerful that they make it hard to compromise, to rejoice, to receive,” said Hofit Hayat, whose husband Danny was killed by the fire. 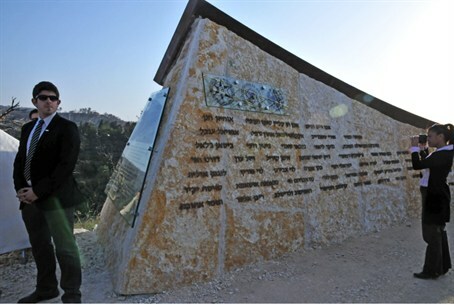 Minister of the Interior Yitzchak Aharonovitch addressed the bereaved families. “Two years have passed since those terrible days of the fire that spread and burned nature and people indiscriminately – women, men and youth, 44 entire worlds, from the Prison Services, the Israel Police and the Fire Services,” he said. “Two years have gone by. The flame of pain, of longing, left us in shock. A year ago a memorial was built for the fallen, but the families that lost their loved ones do not need a memorial,” he continued. “The Ministry of the Interior is with you in your intense pain… The state of Israel lost the best of its sons,” he added. Some bereaved relatives later expressed anger that Aharonovitch was the only senior government official at the ceremony. However, others said they felt there was no need for politicians to play a part in the event.